Here is 2016's most obnoxious (but fun) billboard so far. McDonald's has more than 1,000 drive-thru locations in France. Burger King has fewer than 20. So, McDonald's is using this fact to flame-broil its rival in the most absurd fashion—by putting up a huge temporary billboard that gives driving directions to the nearest—very far away—BK drive-thru. See the full ad here (in print ad form). Click to enlarge. 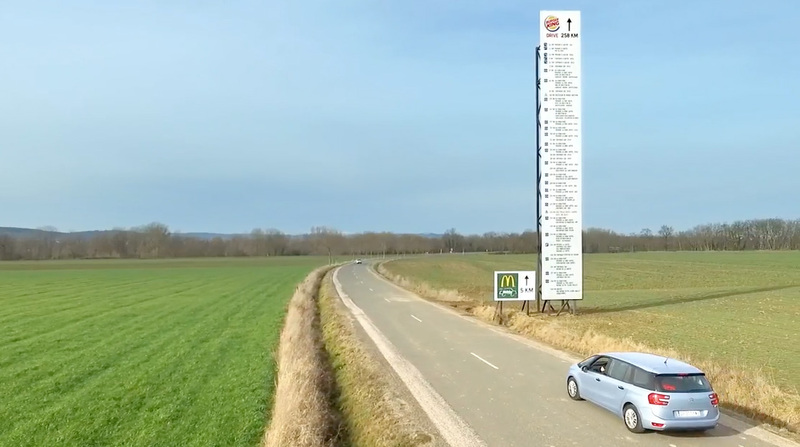 The billboard, made by TBWA\Paris, has gone up Brioude, a town of 6,700 people in the Haute-Loire region, chosen presumably for its particular remoteness from a BK drive-thru. And indeed, the directions take you some 258 kilometers (160 miles) to that BK location, by which point you'll be so famished that you might actually eat the stuff. If you don't have that kind of time, a humble companion board, next to the gigantic one, points out that the nearest McDonald's drive-thu is just 5 kilometers away.